Experience visual art, film, literary art and music throughout downtown Akron in the Historic Arts District. Public and juried votes determine $32,000 in cash prizes. Each weekend will highlight a different art category and spotlight the artists involved. The festival kicks off with Opening Night on Friday, Sept. 14 from 5:30-10 p.m. with a party in the parking lot. (between Summit Artspace/Akron Art Museum at 43 S. Broadway) Complete with live music, live painting, food trucks, interactive activities and more, this is an exciting beginning to what's to come throughout the month. Visual entries continue to be available for viewing every Thursday and Friday at Summit Artspace from 12-7 p.m. and Saturdays from 12-5 p.m. through Oct. 6. Voting closes at 8 p.m. on the 6th. The Nightlight is host to the film festival showing all 28 super short (:60 sec or less) and short (:61 sec-10 minutes) split between two programs, A and B. Screenings take place on Saturday, Sept. 12 between 1-9 p.m. Program A runs at 1 p.m. and 5 p.m. and program B runs at 3 p.m. and 7 p.m. Tickets are free, but because of limited space, it is encouraged to reserve tickets at at nighlightcinema.com. The new category in 2018 is literary art, which will be showcased on Saturday, Sept. 29 from 5-8 p.m. at Uncorked Wine Bar and The Nightlight Lounge. Festival writers have the opportunity to perform their poetry and prose with live readings this night. The festival wraps up on Saturday, Oct. 6 with the music festival and finale celebration at Musica, Uncorked Wine Bar, BLU Jazz+ and an outdoor stage behind BLU Plate from 2-10 p.m. Up to 39 of the participating solo/duos or groups will perform in a festival-type schedule between the four stages. The last band concludes just before 8 p.m., which is when voting closes and the celebration begins with more live music, food, drinks and winner announcements beginning at 9:30 p.m. 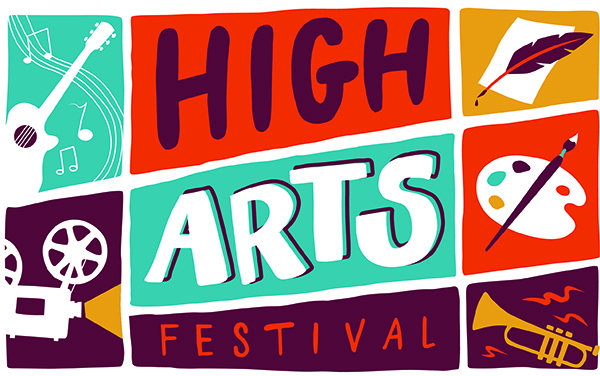 The 200+ entries in all four categories will be available for viewing and voting on higharts.org and the FREE High Arts app available for iPhone or Android devices. Voting kiosks are also available at each venue during the festival weekends for those without smart phone technology.